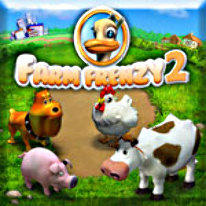 Welcome to Farm Frenzy 2, where with a click, click here and a click, click there, you'll be feeding chickens, collecting eggs, stocking up your warehouse and shipping your goods off to market. When you earn enough money, you'll be able to upgrade your buildings to work faster and buy new equipment that can manufacture the goods consumers want. With colorful 3D graphics, heel-kickin' music and hours of down-home gameplay, Farm Frenzy 2 is a bumper crop of fun!